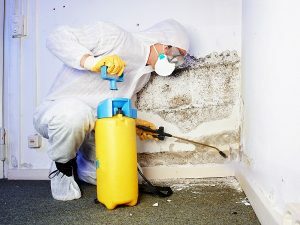 Mold is a woolly growth produced by fungus, especially on moist or decaying surfaces. It can usually be found in dark or steamy areas such as bathrooms, kitchens, and spaces with poor ventilation. Damp basements, leaks in pipes or roofs, and any standing water can create a mold situation. When mold spores are present in large quantities, they can lead to property damage and a variety of health issues, including allergic reactions and respiratory problems, for people and pets. Mold forms quickly and is almost impossible for homeowners to fully remove on their own. If you have mold, then you need Branch Services. Branch Services knows that eliminating the moisture source is the first step at fungal remediation. Then comes the removal of affected contents and the decontamination of replaceable materials. We’ll remove any moldy carpets, then seal off the damaged area. We’ll then open up directly affected walls and bag any additional moldy materials. Debris is vacuumed and affected surfaces are scrubbed with mold cleaner. Drying of concealed wall cavities and enclosed spaces may also be required. Branch Services begins the rigorous process of eliminating present and potential mold by using H.E.P.A. vacs. High-Efficiency Particulate Air vacuums differ from conventional vacuums in that they are capable of trapping extremely small, micron-sized airborne particles. We also perform biocide cleaning of interior surfaces. Biocide kills disease-causing mold, fungus, bacteria, and viruses. Next, we apply a mold/mildew resistant encapsulant. Regular paint will just cover up unseen mold, making it even more difficult to see and treat. An encapsulant paint product contains antimicrobial ingredients that help fight mold. It also seals in any mold remaining on a material, like wood, so that it cannot continue to grow and spread. Occasionally, it is extremely difficult or impossible to remove a material that is contaminated by mold. For instance, drywall and insulation can usually be easily removed and replaced, but the wooden studs inside a wall cannot. In such cases, as much mold as possible is removed from the surface of the wood. Then the wood is cleaned and treated with the encapsulant. Lastly, we perform air purification through ozone treatments, which kills and denatures mold on surfaces. Mold can ruin your home and your health. Removing only some of the mold in your home is pointless. It will simply grow and spread, and you’ll eventually have a full-blown mold issue once again. Our pros will test your home for mold and tell you what kind of mold is growing there, the severity of your mold problem, and the location of mold you may not have spotted. Devising an immediate and thorough remediation plan is essential for getting rid of the mold. Here at Branch Services, we break the mold! Our knowledgeable technicians will promptly find and stop mold, even when it hides in the most hard-to-reach places. Our competitors can’t match our level of expertise or customer service. When it comes to mold remediation, the highly skilled professionals at Branch Services are a breath of fresh air.